The 56 plasmid GreenGate cloning kit can be used to create plant expression vectors containing several cassettes and generate multi-construct transgenic plants. GreenGate is a simple and efficient cloning system for rapidly assembling plant transformation constructs . It is based on the Golden Gate method. Using the type IIS restriction endonuclease BsaI and T4 DNA ligase, ready-to-use plant transformation vectors are built from six types of pre-cloned insert modules and a destination vector in a one-pot reaction. The six module types are (1) plant promoter, (2) N-terminal tag, (3) coding sequence (i.e. the gene of interest), (4) C-terminal tag, (5) plant terminator and (6) plant resistance cassette. Learn more about the GreenGate cloning system by reading Addgene's blog post - Quick, Versatile Plant Transgenesis with GreenGate Plasmids. 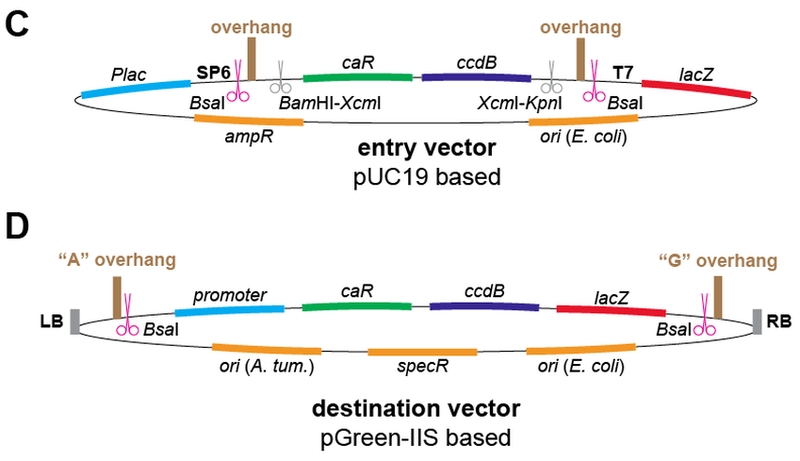 A) The GreenGate cloning system uses six different types of pUC19 based entry vectors into which the single elements are inserted and a pGreen-IIS based destination vector. Magenta scissors depict the BsaI recognition sites. In each GreenGate reaction, six modules are ligated between the left border (LB) and the right border (RB) sequences of the destination vector yielding a ready-to-use plant transformation vector with an expression cassette and a resistance cassette. 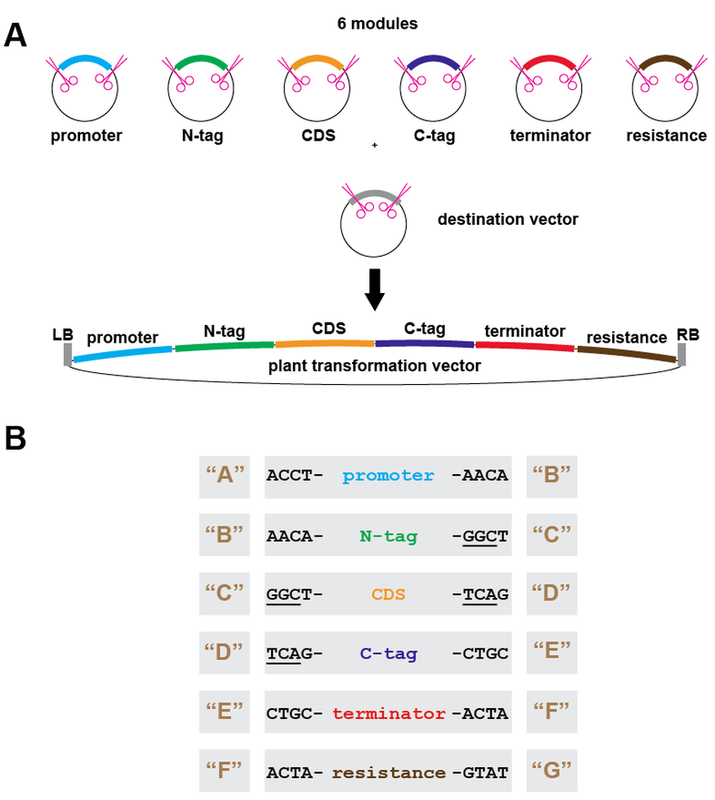 These six modules encompass a plant promoter, an N-terminal tag, a coding sequence (i.e. the gene of interest), a C-terminal tag, a plant terminator and a plant resistance cassette for selection of transgenic plants. The modules can only be ligated in this pre-defined order. B) The orderly assembly is enabled by a set of seven different overhangs. Each module is flanked at its 5’-end by the same overhang as the 3’-end of its preceding neighbor. The individual overhangs all differ from each other (and each other’s and their own reverse complement) by at least two out of the four nucleotides. This ensures that they can anneal only to the complementary overhang from the neighboring module in the right orientation. The underlined nucleotides define coding triplets to which all other elements have to be in frame. C) The entry vectors are pUC19 based. The multiple cloning site of pUC19 has been replaced by two BsaI recognition sites (magenta scissors), the respective overhangs for each module type and a counter-selectable ccdB gene. PCR products can also be cloned via the BamHI and KpnI sites or via A-overhangs after XcmI digestion. Plac = lac promoter, SP6 = SP6 promoter, caR = chloramphenicol acetyltransferase gene, T7 = T7 promoter, lacZ = lacZa coding sequence, ampR = beta-lactamase gene, ori = origin of replication. D) The destination vectors are pGreen-IIS based. A counter-selectable ccdB-cassette has been inserted between the LB and RB sequences, flanked by BsaI sites, with overhangs A and G. promoter = bacterial promoter. The pSa origin of replication (ori A. tum.) requires the presence of the helper plasmid pSOUP in agrobacteria. More information on these plasmids and their use can be found in the original publication. "The plasmid kit used for generation of plant transformation constructs was a gift from Jan Lohmann (Addgene kit # 1000000036)"